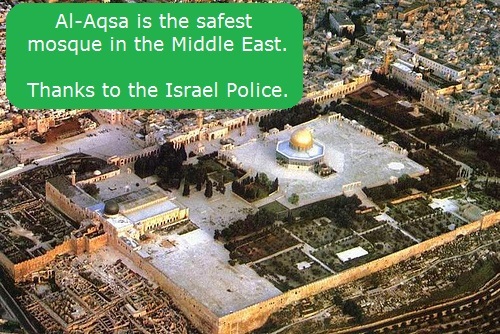 And The Safest Mosque in the Middle East Is...? A terror attack occurred today. Anyone questioning why we have problems with public diplomacy and why we are not influencing the discourse? Guardian: There Must Be A Settlement? there cannot be a true peace. 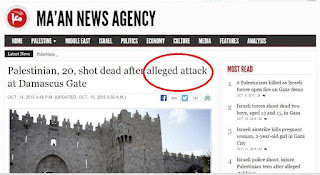 Did the Guardian mean to say that Jews must be able to reside in Judea and Samaria? And I left a comment. This - 'On the Arab side, parents worry that a loved son or daughter will decide to trade their own life for that of an Israeli, or that a family member will be caught in crossfire. ' - while some do, unfortunately not all. See this collection http://palwatch.org/main.aspx?fi=479 Until there is a serious reduction in the existing sympathy for terror in the Palestinian Authority, there cannot be a settlement/agreement. This - 'On the Arab side, parents worry that a loved son or daughter will decide to trade their own life for that of an Israeli, or that a family member will be caught in crossfire. ' - while some do, not all. See this collection http://palwatch.org/main.aspx?fi=479 Until Arab-Islamic societal sympathy for terror stops, there cannot be a settlement/agreement. 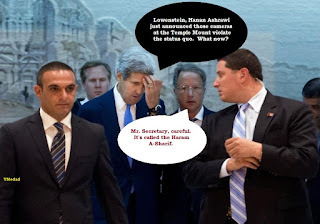 “The placement of cameras in the Al-Aqsa Mosque compound is not only a violation of the status quo;..."
Lowenstein is the Acting Special Envoy for Israeli-Palestinian Negotiations and his State Dept. page is empty. So symbolic. Many Palestinians, however, were not enthusiastic about the security camera idea, a move that Israeli police have sought for years. "It is an additional trap to arrest Palestinians on charges of incitement," Palestinian Authority Foreign Minister Riad Malki said. QUESTION: The question is: Is the Secretary satisfied by the response to what he announced in Jordan and what the prime minister then later said in his statement? QUESTION: So there has been more violence, however, since those events. At least two more Palestinians have been killed. 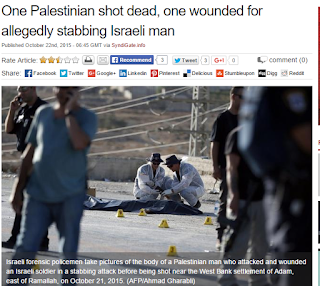 At least one more Israeli citizen, I believe, has been killed. 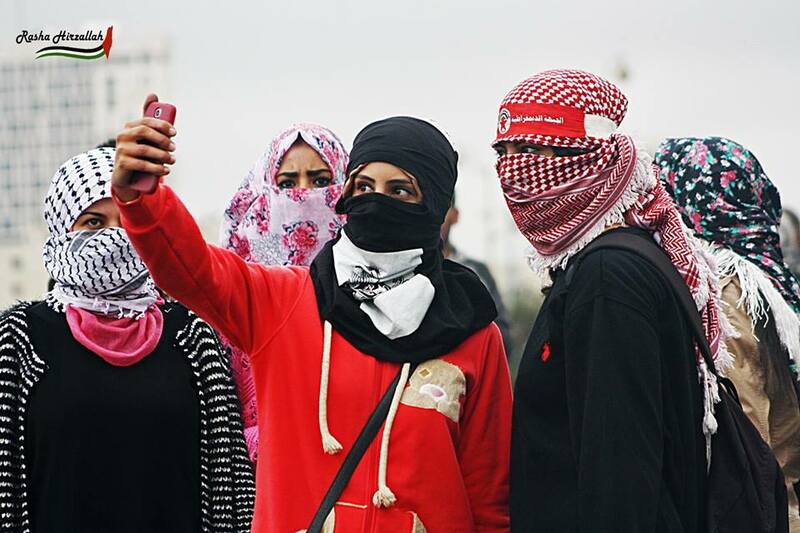 And so it hasn’t led to any immediate easing in the violence, one; and two, the Palestinians have – at least the Palestinian Authority has reacted quite negatively to the notion of 24/7 cameras, saying that they fear that the Israelis will simply use this to surveil their people and arrest those who they think may be troublemakers, whether they are or not. So why is he satisfied when the violence hasn’t been reduced quickly and when the Palestinians – at least, their foreign minister and Saeb Erekat – seem quite hostile to the idea of the cameras? MR KIRBY: Well, that he’s satisfied with his comments should be self-evident, because he made them. That he’s satisfied with the prime minister’s comments – I think that’s beyond dispute. He welcomes the comments the prime minister made Saturday night as useful. But that he is – that he welcomes those comments or that he’s – and he’s satisfied by those statements doesn’t mean that he is satisfied by the potential for more violence and by the actual events of the last couple of days. I mean, he also said on Saturday – and I know you heard him say that the violence has to stop, that there’s no – there can be no excuse for the taking – the deliberate taking of innocent life – that it needs to stop. And so he remains concerned about reports that he continues to see about violence there and, as I said earlier, wants all sides to do what they can to try to bring it to an end. So yes, satisfied by the productive discussions he had, by the statements that were given, but certainly not satisfied that we’re near the end of conflict here just in terms of Israel, West Bank, and especially Jerusalem. MR KIRBY: Well, I’ll let the Palestinian Authority speak for itself. I can tell you that, broadly speaking, the Secretary found his conversation with President Abbas to be helpful and to be constructive, and he was grateful for the opportunity to have that discussion. 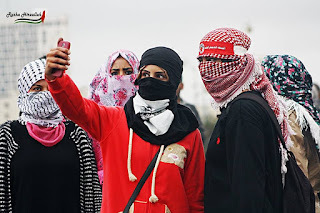 So I’ll let them – let those Palestinians who have a different view on the closed-circuit television camera coverage that we talked about – I’ll let them speak to that. But the Secretary continues to believe that it was a very helpful suggestion by King Abdullah and that it will help increase the prospect for transparency from all sides and for all sides to have this kind of footage available for the public to see 24 hours a day. That’s – that has the potential to be useful, I think, in terms of at least increasing the transparency about what’s going on and potentially, hopefully, having a persuasive effect on discouraging any more violence. QUESTION: One last one from me on this, if I may. 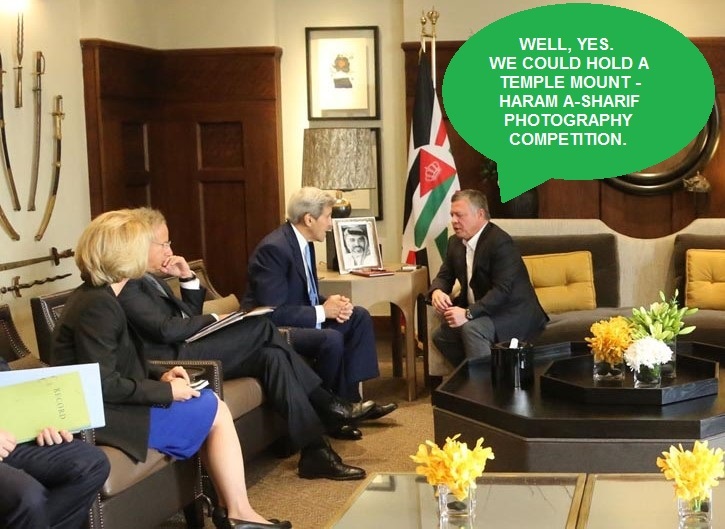 The Secretary had said that there would be technical discussions fairly soon between the Jordanian Waqf and Israeli authorities about the cameras. We are quoting an Israeli official today as saying that the idea would be that the footage would be available to the Israeli Government and to the Jordanian Government but says nothing about it being publicly available. So that’s one question: Is it publicly available or not? 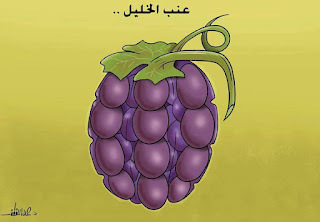 The second question is: Is it just for the Israelis and the Jordanians? The – or might the Palestinians also be able to see it if it’s not available widely to the public? And last – and I know you’re not a direct party to those talks, but you’re clearly deeply involved in the process – have the talks actually begun yet, the technical talks? MR KIRBY: I don’t know. I’d have to refer you to Israeli and Jordanian authorities about whether their technical teams have started to discuss this or not. I truly don’t know. Our understanding coming away from the weekend’s meeting – discussions were that the technical teams would get together very soon. Again, I just don’t know if that’s happened or not. It’s also our understanding, and the Secretary talked about this, that it would be – that this footage – this live, streaming footage – would be available to the public 24/7. That’s our expectation. (Communicated by the Prime Minister's Media Adviser) Prime Minister Benjamin Netanyahu today (Wednesday, 28 October 2015), at the Knesset, made the following statement: "The Temple Mount has been quiet for two weeks. We are making every effort to maintain this quiet, but it would seem that someone is disturbed by this. 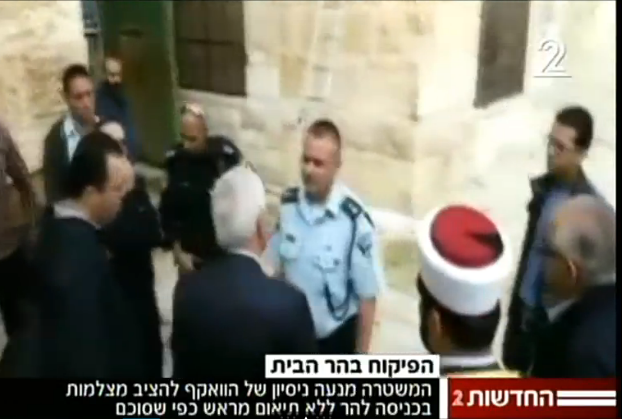 MK Ghattas went up to the Temple Mount, went to the Al-Aqsa Mosque. I assure you he did not do it in order to pray, he did it solely for the purpose of provocation, only to inflame the situation. In accordance with my general directive, the police moved him away. I will not let any Knesset member or minister ignite the Temple Mount, and I call on all members of the Knesset and public figures in general to act responsibly, especially at this time." Jordan's Islamic Affairs minister states that Israel will have no role in implementing the plan, and that the technical installation will take time.Oct. 28, 2015 Jordan's Islamic Affair Minister Hayel Abd Alhafeez Dawood said recently that the authority for installing cameras on the Temple Mount lies solely with the Islamic trust which serves as the site's custodian, and that Israeli authorities have no role in its implementation.In an interview with the Al-Dustour newspaper, the minister said that his office is in charge of setting up cameras on the holy site as part of an agreement reached between Israel and the Jordanian under the auspices of diplomatic efforts led by U.S. Secretary of State John Kerry. He said it was a technical issue that cannot be completed within a day. According to him, the cameras will film the site 24 hours a day and the images will be broadcast live across the world, "like the broadcast the Saudis do" in Mecca and Medina. A Jordanian source revealed that the "occupation forces removed on Wednesday, all the preparations that have been installed in order to set up cameras at the Al-Aqsa mosque yard." The source, who requested anonymity, said "This step is contrary to what has been agreed upon understandings between Israel and Jordan on Saturday in the Jordanian capital Amman, through the intermediary of US Secretary of State John Kerry." 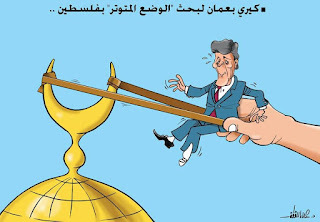 The source added that "the installation of cameras are the responsibility of the Jordanian Ministry of Awqaf and just, pointing out that the understandings indicated that the monitoring of which are part of a committee representing both parties, in addition to the American side. Premier David Ben Gurion today made an unexpected appearance at a meeting of the Legal Committee of the Knesset when the Committee started examining a motion introduced several days ago by Menachem Beigin, leader of the Herut Party, urging the proclamation of Jerusalem as the capital of Israel. Mr. Ben Gurion asked the Committee to postpone discussions on this motion for one week. His suggestion was accepted by all members of the Committee with the exception of the Herut representative. “We, of course, regret the vote and we hope that the resolution will not secure the required two-thirds majority in the U.N. General Assembly when it comes up for a vote. It may be all very well for countries remote from Jerusalem to vote as they did yesterday. But those of us who are close to Jerusalem can see the utter lack of reality in the resolution. It is simply incapable of implementation. 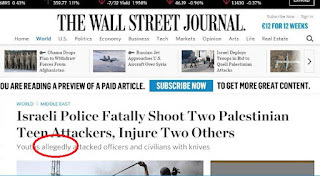 More on the Use of "Alleged"
There was a flurry of media criticism directed at the use of "alleged"* applied to acts of terror violence directed at Israelis but whatever Israelis did was reported as straightforward and factual without any doubt impugned. "Alleged knife attacks against Israelis, fatal shootings of Palestinians by Israeli police and settlers, settler rampage and Palestinians’ demonstrations across the West Bank have become almost a daily occurrence since the first of October 2015, sparking a diplomatic scramble to defuse the situation." That's why we criticise the media. JOURNALISTS have a bad habit. Writing about people suspected of crimes is tricky in many ways, and one of them is conveying the level of facts legally proven to be true at the time of writing. Specifically, journalists too frequently use “alleged” as their own kind of get-out-of-jail-free card, attaching it to a noun that very much implies the suspect is guilty, without the journalist committing to it outright. 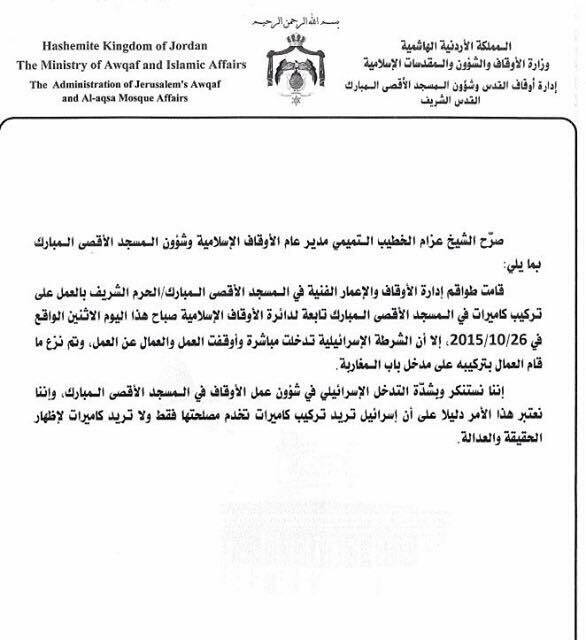 Statement by the Prime Minister's Office: The Instalation of Cameras on the Temple Mount (Monday, 26 Oct 2015) Final arrangements for the manner and location of the cameras on the Temple Mount, which was agreed upon between Israel, Jordan and the United States, were intended to be coordinated by the professional elements. 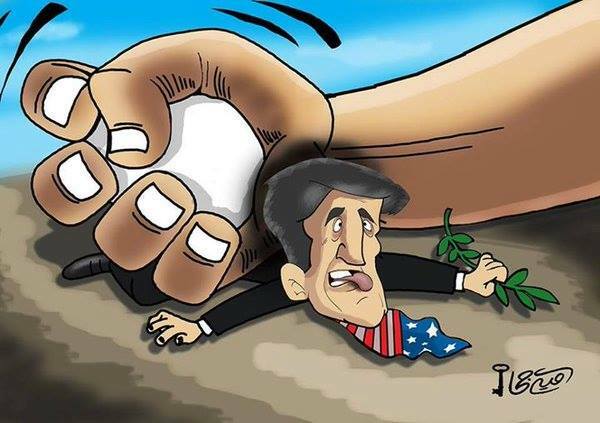 US Secretary of State John Kerry said this at a press conference on Saturday with the Foreign Minister of Jordan: "I expect Jordanian and Israeli technical teams will meet soon to discuss the implementation of this idea." (the installation of cameras). The cameras will be installed according to the arrangements to be determined between the parties. Israel has already expressed its consent to start the process as soon as possible. Installation of surveillance cameras in mosque blocked after Israel isn’t consulted, Israeli police say Israeli police blocked the installation of surveillance cameras inside a sensitive mosque in Jerusalem on Monday...Representatives of the Jordanian Waqf, or Islamic trust, that administers Al Aqsa Mosque in consultation with Israel were stopped from setting up the cameras because they hadn’t communicated their plans before entering the site, Israeli police said. Azzam al-Khatib, the trust’s director, said installation of the surveillance cameras began after orders from Jordanian officials. “When we were stopped by the Israelis from installing the cameras, we immediately notified the Jordanian authorities,” he said. On Monday, Israeli police blocked the installation of surveillance cameras inside a sensitive mosque in Jerusalem, fanning new tensions amid a month long escalation of violence. Representatives of the Jordanian Waqf, or Islamic trust, that administers Al Aqsa Mosque in consultation with Israel were stopped from setting up the cameras because they hadn’t communicated their plans before entering the site, Israeli police said. Speaking to WAFA, Sheikh ‘Azzam al-Tamimi, Head of the Islamic Waqf of Jerusalem, said the Israeli police removed all Waqf-installed surveillance cameras in the vicinity of al-Maghariba (Moroccan) Gate leading to the Mosque’s yards. 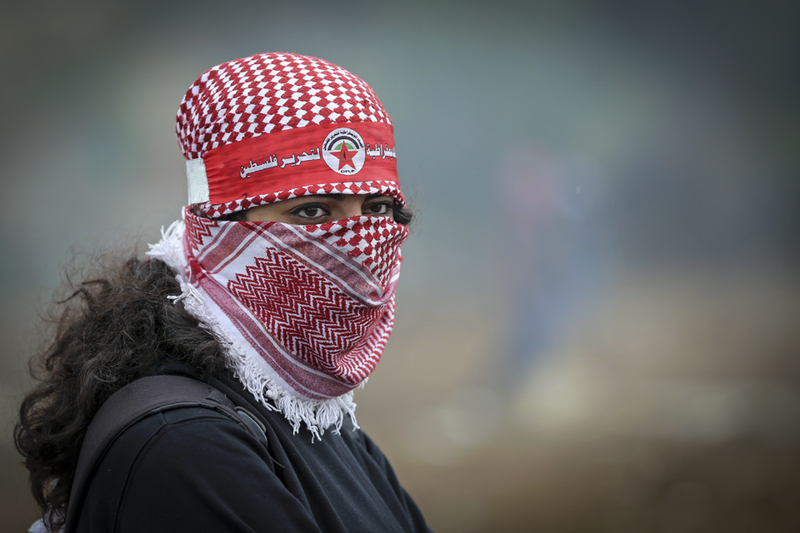 Al-Tamimi claimed that by removing the surveillance cameras, Israel is attempting to “distort the truth”. The Waqf Department vehemently condemned in a press release “Israeli police’s interference with the Waqf’s work” and said such interference indicates that Israel is interested in the installation of surveillance cameras, not for the purpose of providing evidence for truth and justice, but to serve their own interests. Here, in Hebrew, you can see at the beginning the cameras wither going up or probably down and also hear Depty Foreign Minister Tzippy Hotobeli say, as a personal opinion, that she would like to see the Israel flag unfurled at the Temple Mount for after all, the Hamas and ISIL banners have been waved there. The policy of the Government of Israel regarding the Temple Mount was expressed by Prime Minister Benjamin Netanyahu in his statement night, and nothing has changed. Prime Minister Netanyahu made ​​it clear that he expects all members of the Government to act accordingly. Substantial progress in the U.S. efforts came at the Kerry-Netanyahu Berlin meeting, where Netanyahu surprised Kerry, telling him that in the past the Jordanians had proposed to Israel that cameras be installed on the Temple Mount to ensure that no damage was being done to the mosques, and no violations of the status quo. Netanyahu told Kerry that he liked the idea and urged that it be pursued. The Israeli leader suggested that after the secretary’s meeting in Amman with King Abdullah, Kerry would announce Israel’s agreement, and credit would go to the king for the idea. 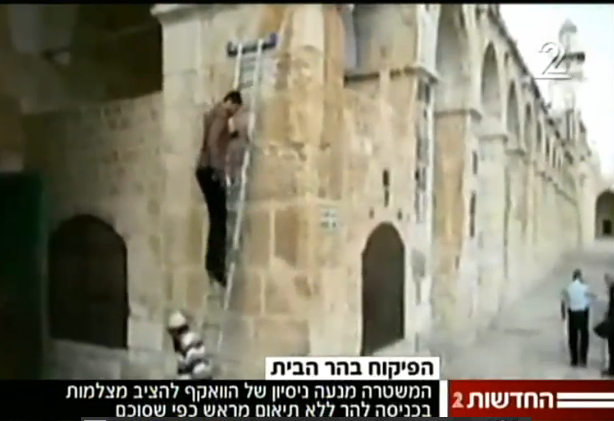 In the near future, teams from the Israel Police and the Waqf will meet to coordinate the issue of the installation of the cameras on the mount and to discuss reinforcing security arrangement to head off the entry of provocateurs from either side at the site. Kerry was very satisfied with the idea of installing the cameras and from his conversation with Netanyahu. At a press conference that followed a short time later in Berlin with German Foreign Minister Frank-Walter Steinmeier, he expressed cautious optimism...The only subject on which Netanyahu made promises was a commitment at this point to bar visits by Israeli cabinet and Knesset members to the mount.The senior American officials noted that Kerry did not raise such a demand. Netanyahu, they said, understood himself the extent to which visits by politicians such as Agriculture and Rural Development Minister Uri Ariel have been damaging and provocative. 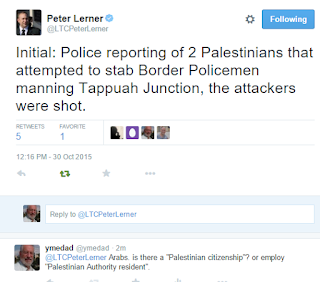 Netanyahu himself made reference to that on Monday before the Knesset committee. "I am not comfortable preventing my colleagues, cabinet ministers and Knesset members, from going onto the Temple Mount," he said, "but the price of a violation could be that we would all enter a major whirlwind and I am not prepared for that." "The Palestinian people reject any international guardianship of the holy sites of any party, especially after the proposal French presence of international forces Al-Aqsa Mosque." That was the current Mufti, Sheikh Ikrima Sabri. supposedly employed by Israel viv a vis the Temple Mount. Hamas rejected statements made by the Secretary of States of the United States...in connection with the obligation of Netanyahu "allowing Muslims to pray at al-HARAM AL-Sharif, and non-Muslims to visit". This declaration is America's attempt to save Netanyahu and the government of the occupation of the crisis in the face of the uprising of the Palestinian people...this declaration is a malicious attempt of Netanyahu's complicity with the United States intended to install control of Zionism on the al-Aqsa Mosque through the granting of the occupation of the right to allow and prevention for Muslims to pray In The Al-Aqsa Mosque. The movement has confirmed that this declaration is equivalent to between the right of the Muslims in prayer and the right of non-Muslims in the visit, in addition to that he does not know the purpose of these visits, which could be interpreted as a right to visit religious extremists of the Jews of the Zionists. The movement announced...caution and vigilance of plots employed in order to circumvent charges that demoralized the occupation and lost his reason, and uphold and protect the al-Aqsa Mosque, be avoided at all costs. It also called on the Palestinian Authority President Mahmoud Abbas and brethren in Jordan, to the non-acceptance of any agreement gives the occupation of the opportunity to manoeuvre and prevarication and in an attempt to circumvent the rights of our people and do their duty to protect the maximum of the al-Aqsa Mosque. It calls on the Arab and Muslim leaders and all the free peoples of the world by standing on the side of an uprising of our people in order to defend the al-Aqsa Mosque. "Recognizing the importance of the Temple Mount to peoples of all three monotheistic faiths – Jews, Muslims and Christians: Israel re-affirms its commitment to upholding unchanged the status quo of the Temple Mount, in word and in practice. As we have said many times, Israel has no intention to divide the Temple Mount, and we completely reject any attempt to suggest otherwise. We respect the importance of the special role of the Hashemite Kingdom of Jordan, as reflected in the 1994 peace treaty between Jordan and Israel, and the historical role of King Abdullah II. Israel will continue to enforce its longstanding policy: Muslims pray on the Temple Mount; non-Muslims visit the Temple Mount. Israel believes that those who visit or worship on the Temple Mount must be allowed to do so in peace, free from violence, from threats, from intimidation and from provocations. We will continue to ensure access to the Temple Mount for peaceful worshippers and visitors, while maintaining public order and security. 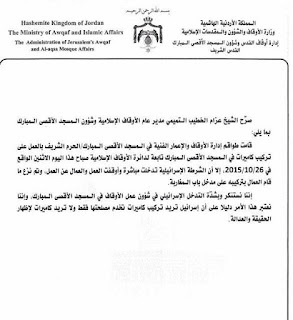 We welcome increased coordination between the Israeli authorities and the Jordanian Waqf, including to ensure that visitors and worshippers demonstrate restraint and respect for the sanctity of the area, and all this in accordance with the respective responsibilities of the Israelis authorities and the Jordanian Waqf. We support the call for the immediate restoration of calm, and for all the appropriate steps to be taken to ensure that violence ceases, that provocative actions are avoided, and that the situation returns to normalcy in a way that promotes the prospects for peace. We look forward to working cooperatively to lower tensions, stop incitement and discourage violence." It was stressed by Abbas the need of the commitment of the government of the occupation of the agreements have been signed, and said, " we'll see if the aspect of the Israeli will in any serious action, so that they can be dealt with ". Abbas' spokesman said Abbas listen to some of the steps, through which Kerry seeks to handle the side of the Israeli people. Abbas emphasized that Jerusalem and shrines and to maintain the status quo of history, and stop the attacks by the settlers, must be the first steps, which must be carried out by the side of the Israeli people. 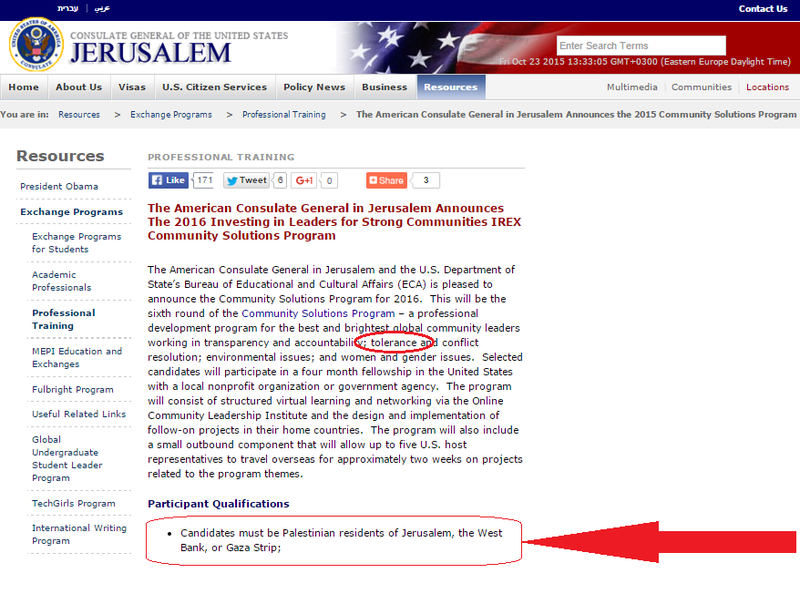 Did you see the last of many posts I upped on the issue of whether the US Consulate in Jerusalem seemingly discriminates against Jews if they reside in the area supervised by the Consulate, Jerusalem, Judea and Samaria? 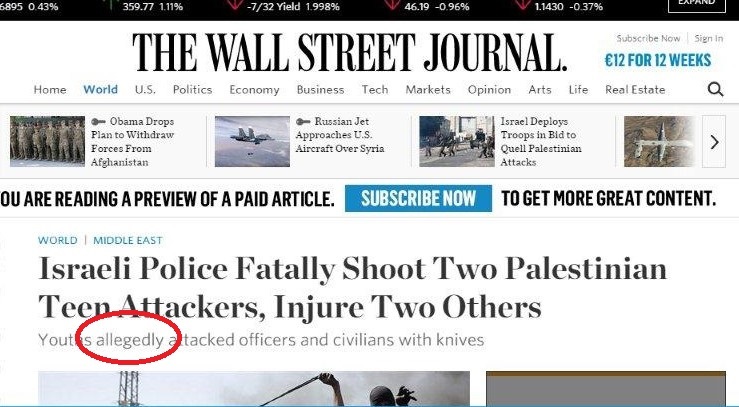 Since 1948, I don't think the term "Jewish Palestinians" exists, except in history books. So, is that program discriminatory? Is tolerance being promoted by limiting so the applications? 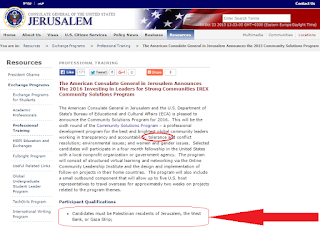 Can Jewish residents of Shiloh, Efrat or Hebron apply? Will they be permitted to participate? 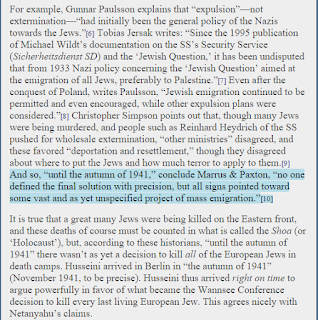 The extermination of World Jewry? And see now Elder. And this. 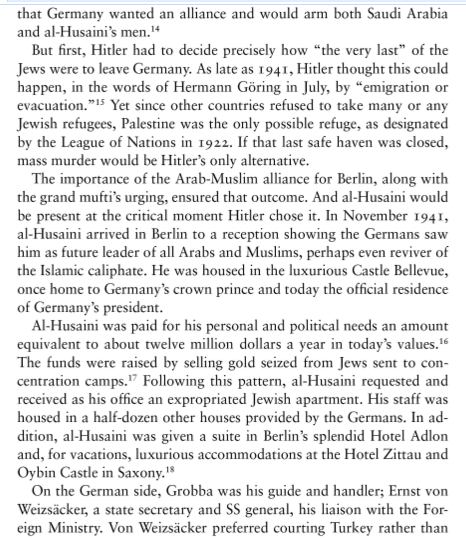 One book, "Icon of Evil: Hitler's Mufti and the Rise of Radical Islam" (2008) - citing Hitler's alleged comment to Husseini "the Jews are yours" - argued that the Mufti's sit-down with the Fuhrer was pivotal. 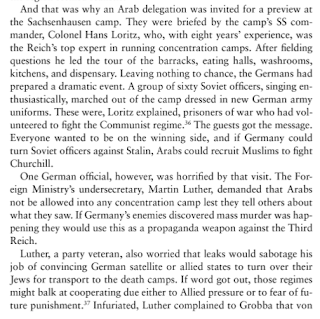 American diplomats in Cairo began to send reports about Arabic language broadcasts coming from Germany and Italy in summer 1939. Kirk sent the first of his dispatches about them to Washington on September 13, 1941. "...thanks to Netanyahu's words we come out of this with a benefit, because he dealt with the centrality of the mufti who for some reason has been taken off the historical stage in everything related to the Holocaust...When Haj Amin al-Husseini met Hitler in November 1941, he told him that there's a stark similarity between Nazism and Islam...Husseini was responsible for establishing SS units in the Balkans. 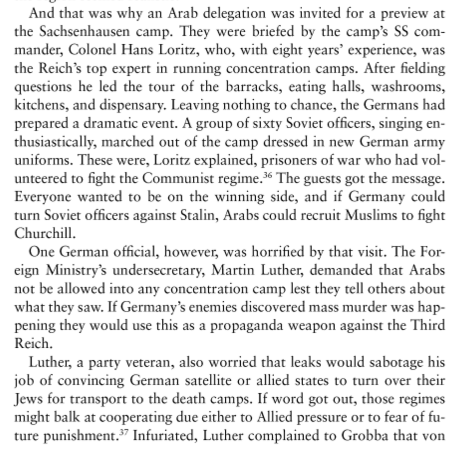 He was friendly with senior SS commanders, and was responsible for Berlin Radio broadcasts in all the Islamic lands." "His Berlin Radio broadcasts would always end by calling to slaughter the Jews. "...The Prime Minister’s remarks were not far from reality. There was a plan by the Mufti to burn the Jews from Arab countries and Jews in Palestine after the German victory in the battle of El Alamein in 1943. Haj Amin al-Husseini was an officer in the Turkish army. I have no proof, but apparently he knew about the Armenian Genocide and drew his ideas from that. None of the historians have referred to that...he played a part in the Farhud - the pogrom against the Jewish population of Baghdad on June 1 and 2, 1941, following the British victory in the Anglo-Iraqi War. Focusing on the details of the meeting is a key error that has plagued much of the commentary about Netanyahu's statement. The real question is what impact the Grand Mufti and those he ordered, inspired and incited had on the Holocaust. 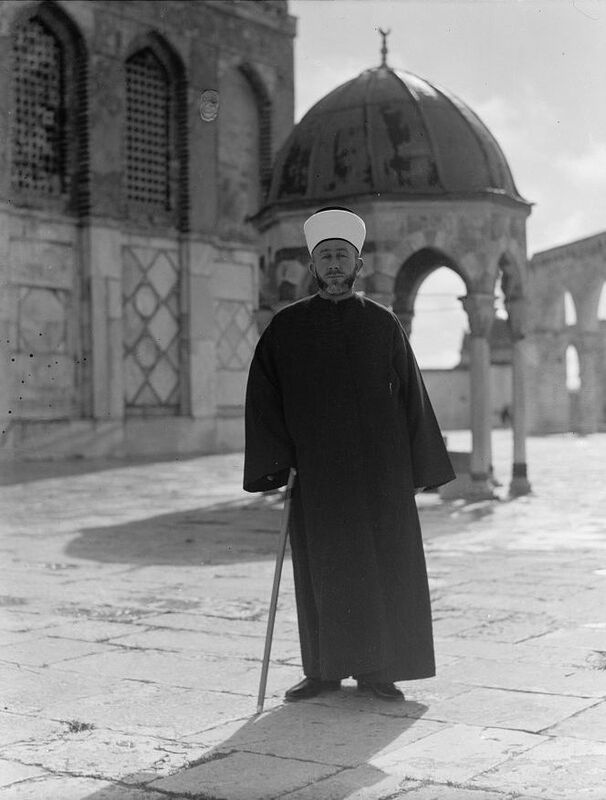 What role did the Grand Mufti and his Palestinian followers have in preventing Jews from escaping the Nazis and getting to the only territory that would take them, the Jewish community in British-run Mandate Palestine? This again prevented Jews from escaping from the Nazis in Europe, and thereby helped implement their extermination. 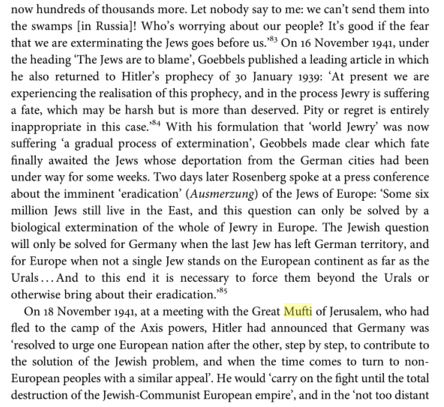 That is, at the very moment when the desperate Jews of Europe most needed a haven to escape to, the Mufti had played a key role in slamming the door. 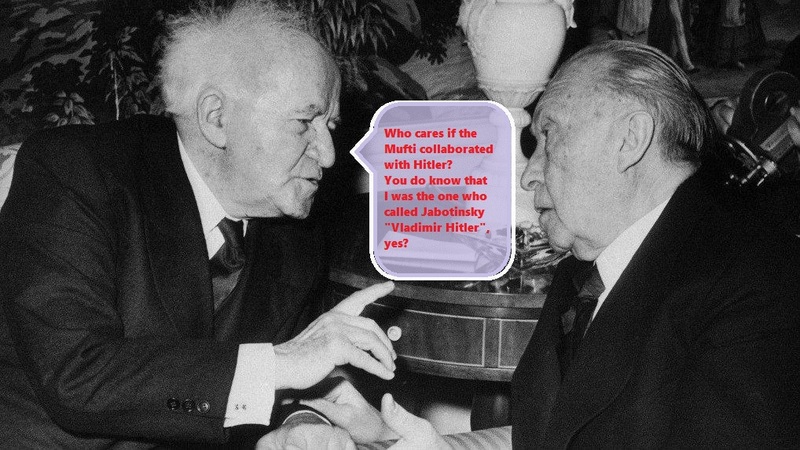 Did you know the David Ben-Gurion referred to Ze'ev Jabotinsky as "Vladimir Hitler"? I am not getting into the argument whether Netanyahu was historical correct, I did that here, or whether he simply could have phrased himself better. I'd just like to point out how Porat herself is misleading. If she can go no further back than 1925 for the beginning of Hitler's extermination plans, well, then, the Mufti preceded him. He instigated, initiated and participated in the April 1920 murderous riots against the Jews of Jerusalem and probably was indirectly involved in the 1921 pogroms. His hatred of Jews, his religious intolerance for them and his plans to exploit his position as Mufti to kill Jews was much more entrenched politically and administratively than Hitler in those early stages. 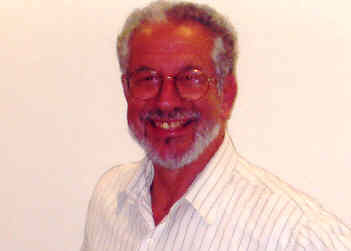 So, Prof. Porat, who was actively trying to eliminate Jews more? P.S. 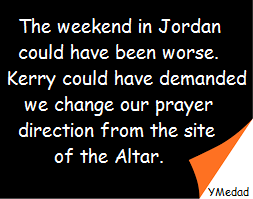 And the Mufti's plans for crematoria in the Dothan Valley? These reports are translated and publicized by Hatzalah Yehudah and Shomron with the clearance and confirmation of the IDF. Hatzalah Yehudah and Shomron is a voluntary emergency medical organization with over 500 volunteer doctors, paramedics, medics who are on call 24/7 and work along with the IDF, 669 IAF Airborn Rescue, the security officers and personal throughout Yesha and the Jordan Valley, and with MDA. 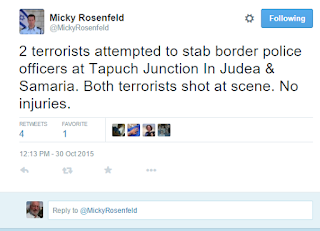 One of the terrorists was eliminated by the policemen who were there, the other terrorist was neutralized. 4 policemen were slightly injured 1 civilian mortally injured. Hevron : following a massive rock attack a resident of Hevron got out of his damaged vehicle and was run over and mortally injured by a Arab truck . Following attempts to save him he died from his injuries. Avraham Asher Chasnu resident of Kiryat Arba HY"D.
Gush Etzion- Rock attacks on vehicles near the villages of G'va Zurif south west of Bethlehem. Earlier there was a violent demonstration by Zurif 2 terrorists were injured slightly in their legs from rubber bullets. Gush Etzion- terror attack by car at the junction- 1 IDF soldier injured and 1 civilian moderately – the terrorists eliminated after he came from the direction of Hevron went up to the place where people wait to hitch a ride, pulled out a knife and the soldier eliminated him. "And this attack and other attacks on the Jewish community in 1920, 1921, 1929, were instigated by a call of the Mufti of Jerusalem Haj Amin al-Husseini, who was later sought for war crimes in the Nuremberg trials because he had a central role in fomenting the final solution. He flew to Berlin. 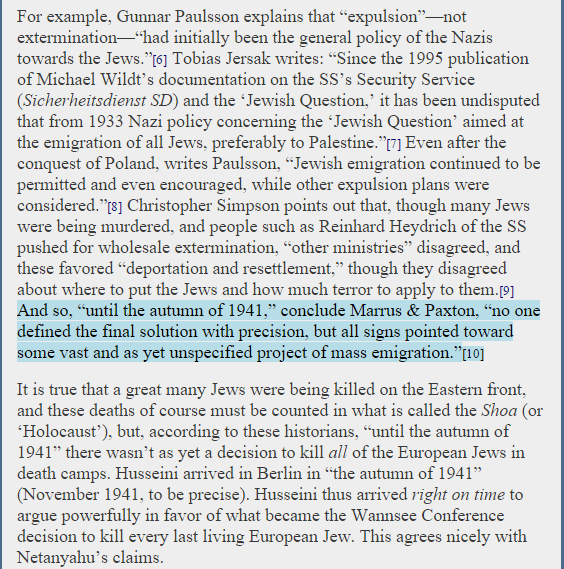 Hitler didn’t want to exterminate the Jews at the time, he wanted to expel the Jews. 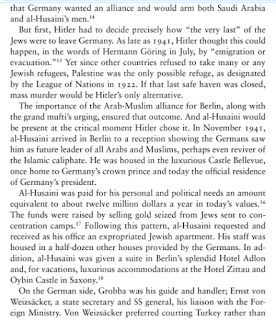 And Haj Amin al-Husseini went to Hitler and said, "If you expel them, they'll all come here." "So what should I do with them?" he asked. He said, "Burn them." And he was sought in, during the Nuremberg trials for prosecution. He escaped it and later died of cancer, after the war, died of cancer in Cairo. 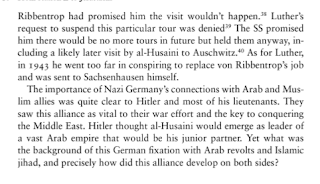 But this is what Haj Amin al-Husseini said. 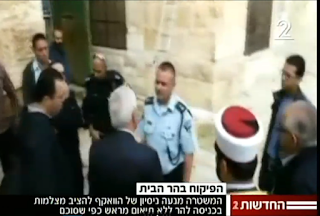 He said, ":The Jews seek to destroy the Temple Mount." My grandfather in 1920 seeks to destroy…? Sorry, the al-Aqsa Mosque. So this lie is about a hundred years old. It fomented many, many attacks. The Temple Mount stands. The a l-Aqsa Mosque stands. But the lie stands too, persists." Zionist Union chairman Isaac Herzog took to Facebook, criticizing the premier for "factual errors." "Even the son of a historian needs to get history right," Herzog wrote. 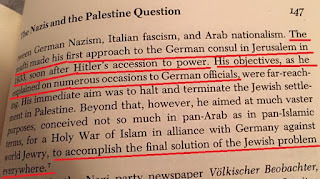 "Yesterday, Netanyahu told the Zionist Congress that the Nazis didn't want to exterminate the Jews, but instead were seeking to expel them, and that it was the mufti, Haj Amin al-Husseini, who gave the tyrant Hitler the idea [to commit genocide]." "This is a dangerous distortion of history, and I demand that Netanyahu correct this immediately since he is trivialiazing the Holocaust," Herzog wrote. "[Netanyahu] is minimizing Nazism and the role played by that awful tyrant, Adolf Hitler, in the terrible tragedy that befell our people in the Holocaust," the opposition chief wrote. "[The premier's comments] play into the hands of Holocaust deniers and pits them against the Palestinians." Zevaha Galon of the left-wing Meretz party said Netanyahu's remarks show "the depths to which this man has sunk." 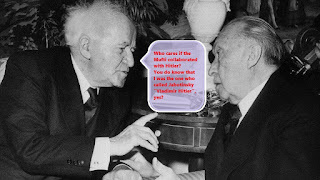 Being that the Mufti was a Nazi sympathizer from 1933 and that contacts between the Mufti and Nazi leaders preceded by years the 1941 decision, I really do not think anyone can exclude a possibility that the Mufti indicated that he demanded of the Nazis to deal with the Jewish Question on European soil and not allow any more Jews into the Palestine Mandate. But more importantly, the fact is that the Mufti explicitly contributed to the 1944 demise of Hungarian Jewry by a fiery extermination method. Sorry, I forgot the poisoning the water operation in 1944. P.S. 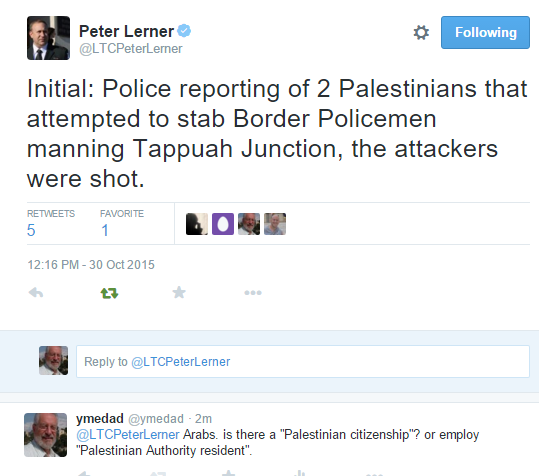 and leave it to revisionist historian Saeb Erekat to befoul matter. 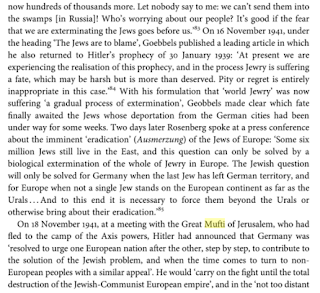 'The Mufti was instrumental in the decision to exterminate the Jews of Europe. The importance of his role must not be ignored. The Mufti repeatedly proposed to the authorities, primarily Hitler, Ribbentropp and Himmler, to exterminate the Jews of Europe. He considered it a suitable solution for the Palestinian question'. 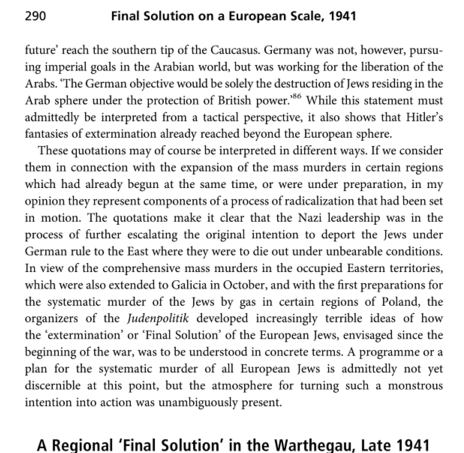 'The Mufti was one of the instigators of the systematic extermination of European Jewry and was a partner and adviser to Eichmann and Hitler for carrying out this plan'. 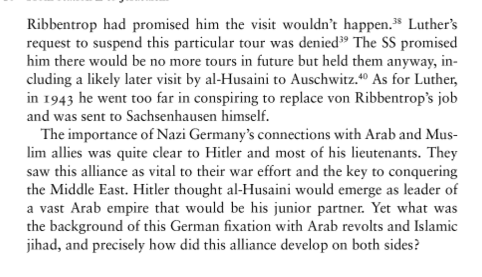 The attempt by certain scholars and people to be apologists for the key and important role of Haj Amin al-Husseini, is clear. 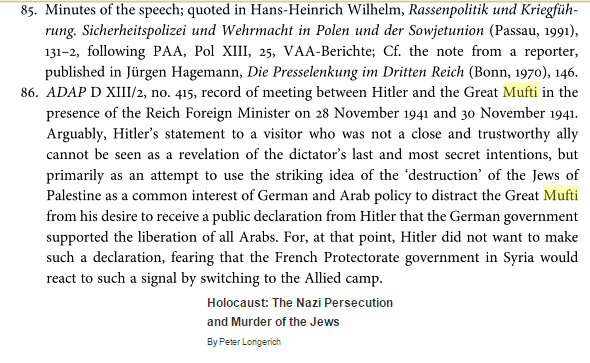 Many other researchers cite this testimony and others regarding the role of Haj Amin al Husseini. 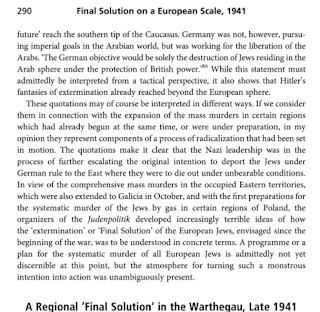 My intention was not to absolve Hitler of his responsibility, but rather to show that the forefathers of the Palestinian nation, without a country and without the so-called 'occupation', without land and without settlements, even then aspired to systematic incitement to exterminate the Jews. 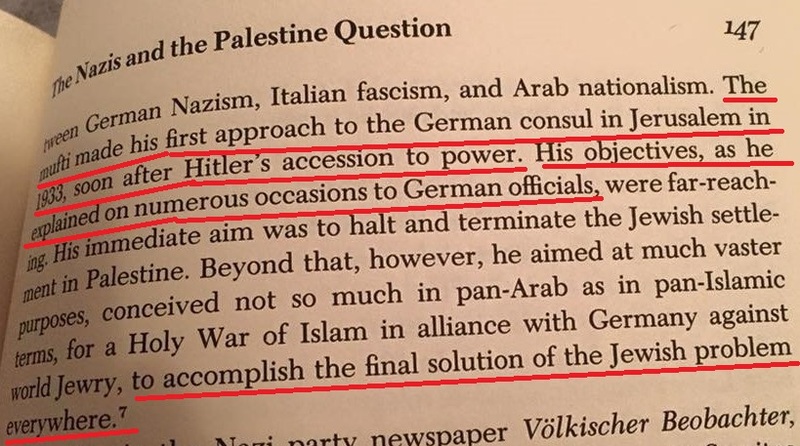 Unfortunately, Haj Amin al-Husseini is still a revered figure in Palestinian society, he appears in textbooks and it is taught that he is one of the founding fathers of the nation, and this incitement that started then with him, inciting the murder of Jews - continues. Not in the same format, but in a different one and this is the root of the problem. To stop the murders, it is necessary to stop the incitement. 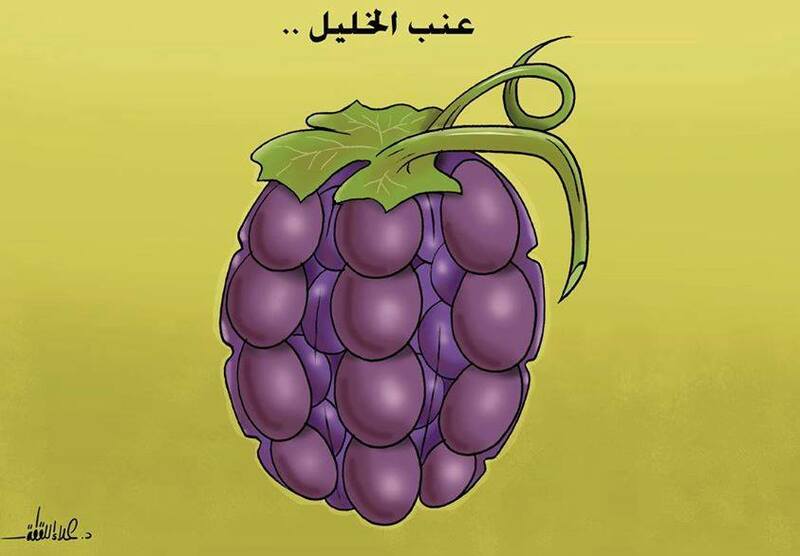 What is important is to recognize the historical facts and not ignore them, not then and not today". 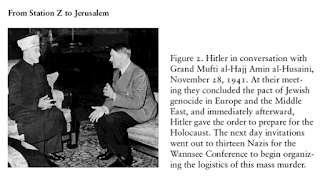 in June 1941, Hitler briefly mentioned his vague hope of “exploiting the Arab Freedom Movement” after the Soviets were defeated, and in November he agreed to meet Amin al-Husseini, the Grand Mufti of Jerusalem, to talk about his “uncompromising fight against the Jews”. During 1938, a booklet Muhammad Sabri edited, Islam, Judentum, Bolschewismus (Islam, Jewry, Bolshevism), was published in Berlin by Junker-Duennhaupt [Dünnhaupt]. Sabri’s booklet included Hajj Amin el-Husseini’s 1937 declaration—also deemed by some as a “fatwa” (an Islamic religious ruling)—appealing to the worldwide Muslim umma. 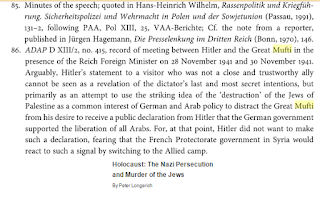 El-Husseini’s declaration was extracted and reprinted, separately, by the Nazi regime as Islam und Judentum (Islam and Jewry), and distributed to Muslim SS units in Bosnia, Croatia, and the Soviet Union. As I detailed in a 2103 monograph, which provided, and riveted upon, the first full English translation of el-Husseini’s 1937 “religious edict” (“fatwa’) about the Jews (available here; and as a free pdf here), the former Mufti of Jerusalem exclusively invoked traditionalist Islamic themes, familiar to the Muslim masses, to incite their annihilationist Islamic Jew-hatred. Reiterating foundational Jew-hating motifs from the Koran itself, and embodied by the inflammatory words and murderous actions of Islam’s prophet Muhammad (in the “hadith” or traditions, and earliest piousMuslim biographies of Muhammad), el-Husseini’s traditional Islamic Jew-hatred has remained a staple of contemporary Palestinian Muslim religious discourse, through the present. Does The Guardian Guard You From Bias? 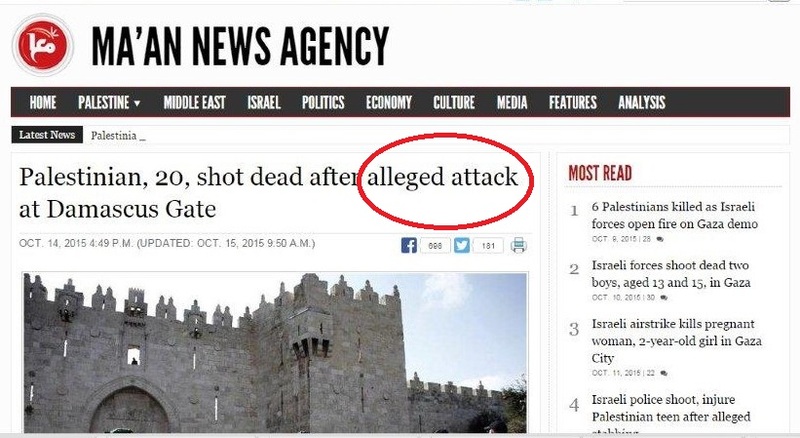 BBC Can't Locate "Deep Inside Israel"
What Was To Be A Part of Syria? But Do Muslims Believe NYT's Reporting? One Last Chance for Abbas. Really?